We need to consider UK higher education in the context of a situation where neoliberalism, in some ways, has been destabilised economically but remains hegemonic on an ideological level. At this point in time, the banks have not recovered, unemployment is predicted to surpass 3 million next year, but in that confidence game that is the economy, there is still an underlying sense that if we think things are normal and start shopping again, then things will be (and apparently the banks, even those that were nationalised last year, have started paying executive bonuses again).1 This mentality is fuelled by wishful thinking in the media about ‘green shoots' (quickly dispelled by news of job losses, company bankruptcies and gloomy GDP statistics). Those who have not had to worry about losing their jobs or homes (yet) can sit tight and weather the storm, thinking, ‘it won't be me', or even, ‘I'm all right Jack'. After generations of the internalisation and naturalisation of free-market ideology it's become very hard to imagine that there could be any other way of doing things. And so after years of neoliberal managerialism as a raison d'etre, the UK government is having an identity crisis. Despite the current uncertain condition of the ‘free markets' it still continues to reform the public sector along business lines. This is exemplified by the attempt to force through the part-privatisation of Royal Mail (justifying this controversial move as ‘modernisation') until Peter Mandelson declared that the plans were put on hold due to a lack of credible bidders.2 Other reforms, such as the Welfare Reform Bill, are still based on a boom logic in which market prosperity is seen to provide for all, and so the responsibility of government is limited to (minimally) helping people enter the workforce. There is also an underlying elitism in the arguments in favour of both the fee increases and cuts to institutions which traditionally serve working-class populations: that the taxpayer is propping up students who should not be there in the first place. For example, Policy Exchange's recent report on ‘failing universities', Sink Or Swim, argued that London has too many academic institutions, and that one of them had to go (singling out London Metropolitan University as the scapegoat).13 The stereotype used against accessible education is often that of the second-rate ex-polytechnic, bloated with mediocre students who coast through dumbed-down courses and receive overinflated grades by staff with dubious qualifications. At the same time, a dire situation faces the latest generation of graduates whose future has literally been mortgaged, and who are now, in many ways, those who must pay for the crisis. Carrying debt burdens that average £20,000 after a BA, they have also priced out of the housing market.14 They have had to work during their studies, in many cases full-time hours, and were not able to experience education as respite from the routine of the workplace that at least some of their parents' generation could.15 They have also had to deal with an education that has become progressively instrumental and marketised, facing pressure to not ‘make mistakes, take risks, or pursue any unorthodox form of inquiry that could compromise the all-important 2.1'.16 hey now face bleak job prospects as graduate unemployment is set to rise by 22,000 this year.17 This phenomenon is not limited to the UK, as phrases such as ‘the 700 Euro Generation' (Greece), ‘the 1,000 Euro Generation' (Italy), and the ‘Internship Generation' (Germany) enter common speech.18 The situation for university staff is equally bleak as universities are told by government to make ‘efficiency savings', which translates into cuts and redundancies. 19 Poor scores on the Research Assessment Exercise (RAE) - the quality control regime for education - become used as an excuse close departments, as in the defeated attempt to shut down the Politics and Communication, Philosophy and Statistics departments at Liverpool John Moores University. In some cases, courses with no apparent reason and with little to no consultation with staff, such as the axing of French, Spanish and Chinese languages at the University of the West of England, or the cuts to the School of Healthcare and the Faculty of Biological Science at Leeds Metropolitan University, or the Ceramics department at the University of Westminster, to name a few.20 There are also attempts to cut student support and IT services, such as at University College, London (in this case outsource email provision to Microsoft Exchange). The worst case of course, is that of London Metropolitan University, which could lose the equivalent of 800 jobs (¼ of the workforce). There is a contradiction here between the regulations (which restrict entry for non-EU students and staff) and the financial dependency of many institutions on overseas students (who pay much higher fees than EU students). In response to the recession, it would be very tempting to charge overseas students even higher fees (limited, of course, by the worry that this will deter them from applying, leading to a loss of revenue). It is a controversial issue as the presence of overseas students has become associated with the marketisation of education. Another stereotype of the ‘undeserving student' is the ‘cash cow': the overseas student who comes to the UK to accumulate cultural capital with the goal of using it to comparative advantage on return home; who is spoiled and sheltered, who has limited English skills and even academic abilities, and, obsessed with status and authority structures, who is unable to ‘think critically' - and who has been let in purely because of the ability to pay. In response to these developments, resistance needs to take place on several fronts at once: to oppose the marketisation of education AND ALSO xenophobia and border regimes on campus. This is not an easy task. Resistance that has taken place so far, while courageous in many ways, has been fragmentary and has yet to transform into widespread public anger. For example, a series of occupations took place in response to the Gaza invasions (which, although not strictly part of the response to the recession, may have inspired other activism). 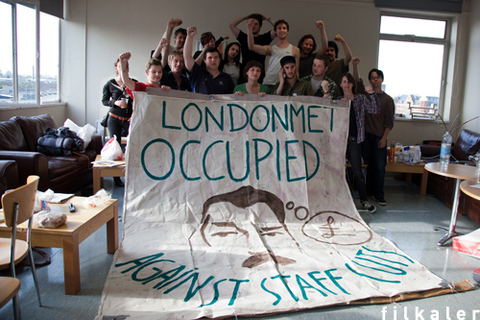 In reaction to the cuts at London Metropolitan University, staff and students have staged regular rallies and occupations. Most recently, at the School of Oriental and African Studies (SOAS), students and staff occupied the building in response to the deportation of nine cleaners, who were raided by UKBA shortly after winning union representation and the London Living Wage. Students and staff have begun a campaign opposing the Points Based System for Immigration, following motions on noncompliance being supported at the University College Union (UCU) 2009 national congress.23 There have also been various alternative education projects, including attempts to set up free schools in squatted buildings. As I see it, there are also several challenges facing any resistance. First of all, NUS leadership is perceived as a fast track to a political career in the Labour Party. NUS has done some very important research about student debt and regularly comments on student issues in the press, but this has not really been accompanied by action that would raise the stakes (and bring NUS into a potential conflict situation with government). Nor does NUS leadership seem to be taking up the immigration issue in a serious way. However, resistance to these developments is taking place at a grassroots, localised level, including at my own institution (Goldsmiths). Staff have been taking action in response to the cuts, and there is a national campaign to defend jobs in education - which has had some positive results so far, stopping cuts at a few institutions. However, this has yet to turn into extended industrial action at multiple institutions - which might be what is needed now in order to put serious pressure on. The second challenge is that, compared to other European countries where marketisation is being introduced at lightning speed (such as Berlusconi's education reforms in Italy), these sorts of developments have been comparatively gradual in the UK. This means that there is no shock and outrage at a sudden loss of rights and freedoms, but a slower adaptation and naturalisation process where it becomes harder to imagine education as anything other than a commodity. The third challenge is related, and has to do with a collective mood of cynicism, disempowerment and fatalism. This is connected to the economic pragmatism mentioned earlier (that we can only make the most modest demands), but also to neoliberalism remaining intact as hegemonic common sense. According to this line of thinking, any collective struggle is pointless, so if I just keep my head down and make sure that I'm OK as an individual, then things will eventually work out. This is perpetuated by mainstream media coverage, which focuses on the ranking of institutions and other aspects of education as a consumer product (such as, for example, the Guardian's education section). Protest, when it is mentioned in the mainstream press, is often derided as pointless. The comments following the articles are even more dismissive: student activists are middle-class whingers and staff are overpaid public sector fat cats (unlike those in the private sector, supposedly the ones really suffering). I would argue that this sort of cynical disempowerment is the most difficult challenge, and also the most necessary to deal with - which is the basic idea that education is actually a struggle worth engaging with. Thanks for posting and formatting, interesting article. On subbing, made a couple of quick changes: swapped free tag universities to universities from our drop-down list of sectors, and edited the title to include words which might attract more Google referrals.